Becoming a Pokemon master is a treat in these charming Switch games. Pokemon: Let’s Go, Pikachu, and its sister game, Let’s Go, Eevee, are the latest games in the mega-popular Pokemon video game franchise. They’re simpler versions of traditional Pokemon RPGs (such as Pokemon Ultra Sun and Ultra Moon, which launched on 3DS in late 2017), but they’re made all the more accessible (and dare we say it, fun?) because of it. Pokemon: Let’s Go, Pikachu and Let’s Go, Eevee are set in a world inspired by Pokemon Yellow, which was released on Game Boy in 1999. The games let players travel the Kanto region of the Pokemon universe on their quest to become the ultimate Pokemon trainer. This can come in multiple forms -- players can choose to simply collect as many Pokemon as possible to fill out their in-game Pokedex (a collection album), or work to become a master battler, building up each Pokemon’s stats to take on the game’s most difficult opponents (and other real players in multiplayer battles). Whether the final goal is to collect or battle Pokemon, players will progress through the main game in much the same way. 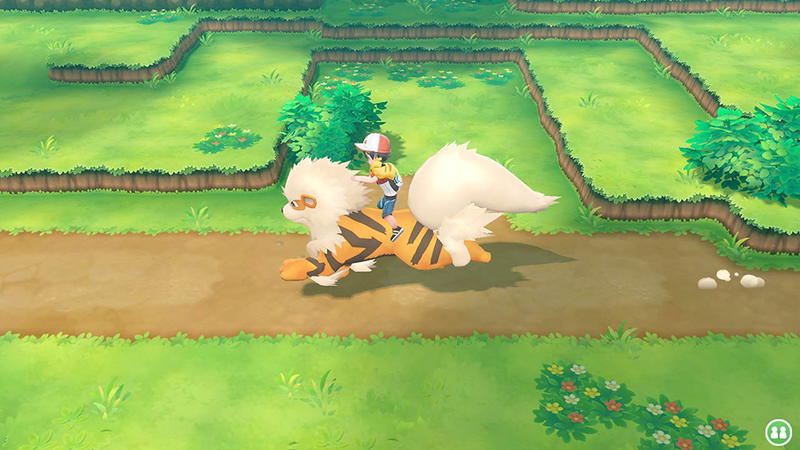 They’ll travel between a variety of in-game towns as they experience a single-player storyline, and they’ll have the opportunity to capture wild Pokemon and battle computer-controlled trainers in between each city. The capture system borrows heavily from the one in Pokemon Go, asking players to throw a Poke Ball at the wild pocket monster at the right time, based on the movement of a colored circle which indicates how difficult the Pokemon will be to catch. Since Switch games can be played in either handheld or docked mode (on the TV), the capturing system varies slightly depending on whether players are physically holding the Switch in their hand. When docked, users can play the entire game with a single Joy-Con, or the optional Poke Ball Plus controller, which is sold separately. 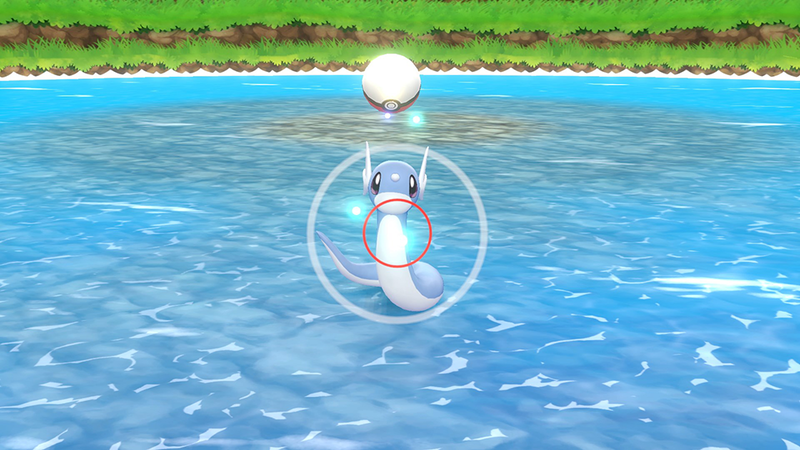 Capturing in this mode asks users to physically move the Joy-Con to mimic tossing a Poke Ball at the screen. This is fun in short bursts, but loses its novelty quickly, especially with the game encouraging users to capture duplicate Pokemon in bulk to earn Candy (more on that in a bit). You’ll also want to ensure littles wear the wrist strap when playing with a Joy-Con or Poke Ball Plus, so the controller isn’t accidentally tossed across the room in the heat of the moment. When playing in handheld mode, users can either physically move the Switch or use the left analog stick to “aim” their throw, and then press the “A” button to toss the ball. While we prefer playing docked, so we can enjoy the game’s adorable graphics on the big screen, this handheld configuration provides the best controls in the long run. The capturing system is perhaps the biggest difference between Let’s Go and a traditional Pokemon RPG. In older games, players would need to battle each Pokemon they wanted to capture. During these battles, users would need to whittle down the wild Pokemon’s health (but not entirely defeat it) to increase their odds of capturing the critter when they threw the Poke Ball. That system makes for longer, more tedious battles. Here, capturing Pokemon is (typically) much faster and simpler, which we preferred. As players capture Pokemon they’re not interested in keeping, they can send them to Professor Oak to assist him with his Pokemon research. In exchange, players receive all sorts of Pokemon Candy, which can be fed to critters to increase their stats and make them stronger in future battles. Certain candy can even make Pokemon immediately level up. However, even without feeding a Pokemon berries, it will still level-up as it’s kept in the player’s party (up to six can be in the party -- that is, taken into a battle -- at once), which will help users take on the increasingly difficult opponents they face as they progress through the game’s story. Many (but not all) Pokemon will evolve when they reach a certain level, which is an exciting event if kids aren’t expecting it (that is, if they didn’t know the Pokemon’s evolution level requirement beforehand). Other Pokemon can be evolved by exposing them to a particular “Stone,” while others don’t evolve at all. 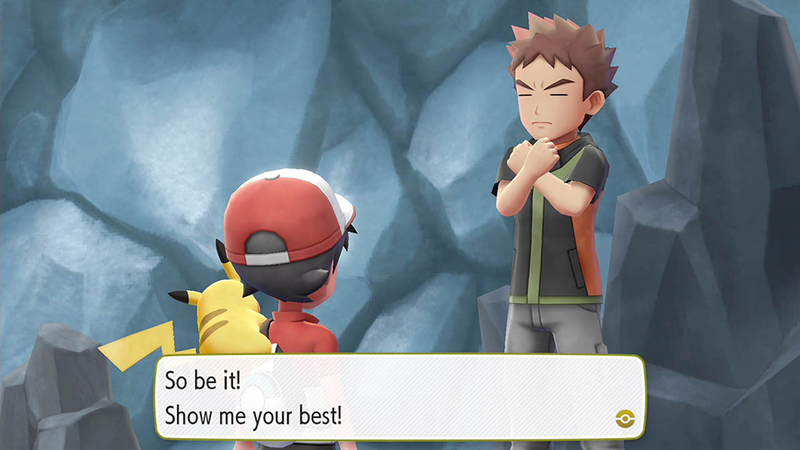 Finally, players can test their skills in Gym battles, taking on Pokemon owned by challenging gym leaders to earn badges that serve as trophies to show off their accomplishments. What’s the difference between Let’s Go, Pikachu and Let’s Go Eevee? Each game gives players a different partner Pokemon, which will hang out on the player’s shoulder (Pikachu) or head (Eevee) as they navigate the in-game world. Kids can interact with their partner Pokemon by petting it and dressing it up in cute outfits and accessories, so the choice between both games can easily come down to which of the two Pokemon someone likes best. Both games also contain version-exclusive Pokemon, which can’t be captured in the wild in the other game. 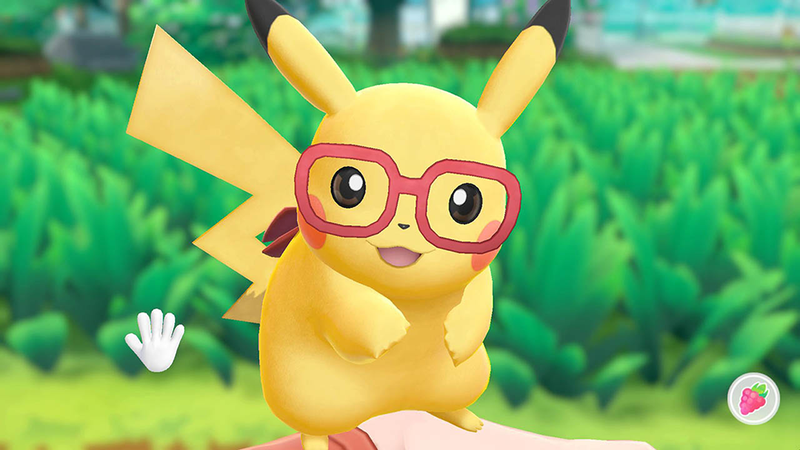 For instance, in Let’s Go, Pikachu, players can encounter Pokemon like Oddish and Sandshrew in the wild, while Let’s Go, Eevee players can run into critters like Bellsprout and Vulpix. But these exclusive Pokemon aren’t as big of a deal as they may have been in previous games. For one, users can trade Pokemon with their friends online to collect any their game doesn’t contain. More importantly, though, Pokemon Go players can connect their account to Let’s Go and transfer over as many critters as they want, including those they can’t capture otherwise. There are two important things to note here: Players can only transfer over critters found in the Kanto region of the Pokemon universe (including their Alolan forms). In addition, it takes a long time to get to the point in Let’s Go where you’re even allowed to transfer critters. If this is a major selling point to you -- letting your kids see their mobile critters come to life on the big screen -- keep in mind they’ll need to play for hours before being able to do that. Are these games ok for younger players? The content here is entirely family-friendly (the Let’s Go games are rated E for Everyone), but the storyline plays out through text, rather than voice acting, so younger players may need help following along with the story. The game’s battle system also has the potential to be rather complex. It’s easy enough to throw Eevee or Pikachu into every battle and just attack, attack, attack, but that’s not the wisest strategy. Each Pokemon has a “Type” (Water, Grass, Fire, etc. ), which is stronger and weaker against certain other types (for instance, Grass is weak against Fire). 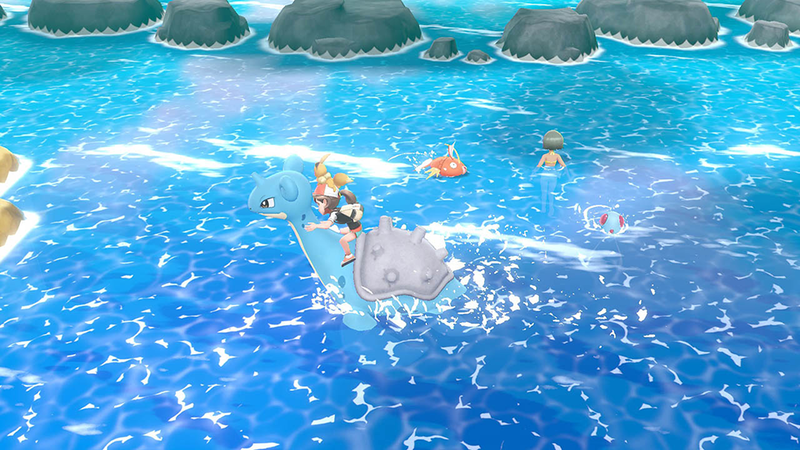 Players will find battles are much easier if they exploit the rival Pokemon’s weaknesses, rather than using the same critter each and every time. Once players memorize these strengths and weaknesses, they can take their knowledge with them into all major Pokemon games, which work in the same way. However, it may take them a while to master the system. Until then, there’s no shame in using a chart that shows off each type’s strengths and weaknesses. Let’s Go also allows two players to travel the world together cooperatively when the Switch is docked. The second trainer doesn’t have their own Pokemon, but they do get to control one of the first player’s Pokemon in battles, and help throw Poke Balls when capturing a wild critter. This can quickly turn the tide of a challenging battle (the support trainer can be called in during combat), changing a 1-on-1 encounter into a 2-on-1. Even if another real person isn’t available to control the support trainer, there’s nothing stopping players from controlling both characters on their own using two controllers (either both Joy-Con, or one Joy-Con and the Poke Ball Plus). 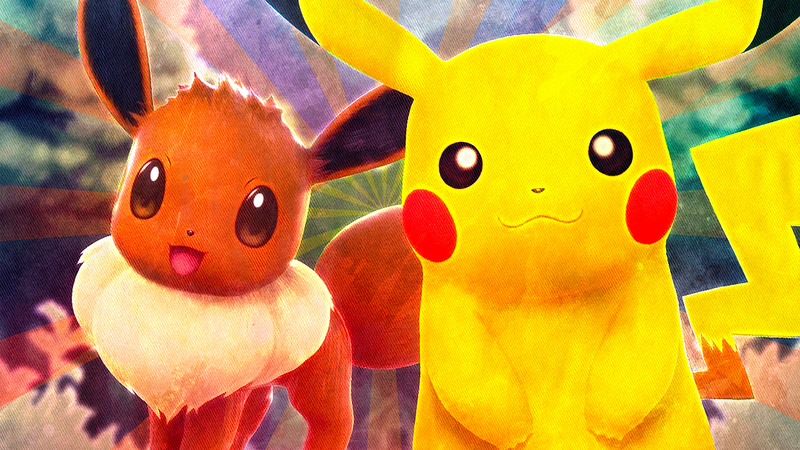 Pokemon: Let’s Go, Pikachu and Let’s Go, Eevee may be simplified versions of their predecessors, but that’s definitely not a bad thing. The bright and colorful in-game world is fun to explore (the graphics are just awesome), the Pokemon Go-style capturing system is a joy compared to the battle system of games past, and the ability to interact with our partner Pokemon is giggle inducing to say the least. These are awesome games the whole family can enjoy, whether this is your first time traveling into the Pokemon universe, or you’re well on your way to becoming a Pokemon master.